The Jaspe with Huipil apron takes our Classic Jaspe apron and embellishes the bodice with a swath of lovely contrasting/coordinating huipil** embroidery. 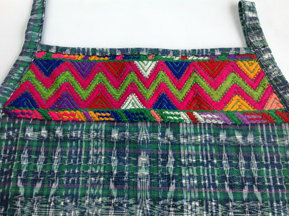 Our Green Jaspe with Tecpan Huipil features our green jaspe fabric with multi-colored motifs that can be a mix of stylized animals, people, flowers, and geometrics. Due to the number of variations in jaspe* and huipil** fabrics available, please choose your basic color palette preference and allow us to choose the fabric. The exact fabrics you see here may not be available.